NETWORK UPDATE: The season finale of NCIS, AMERICAN IDOL and THE FLASH each went up 0.1 in final numbers. IZOMBIE lost 0.1. CABLE HIGHLIGHTS: As the NBA PLAYOFFS get deeper toward the championship, the ratings are rising, with both games on TNT last night at 2.34–putting them above everything on broadcast TV for the night. The NHL PLAYOFFS on NBC Sports Net were as usual way behind, at 0.33. 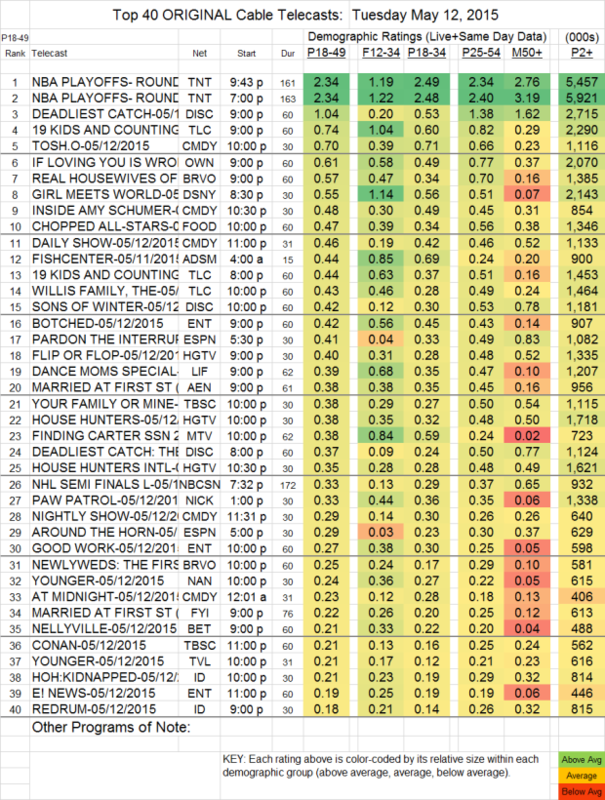 Elsewhere, THE DEADLIEST CATCH (Discovery) was up 0.08 to 1.04, with lead-out SONS OF WINTER up 0.04 to 0.42. On TLC, last week’s 19 KIDS AND COUNTING was a 2-hour that was at 1.04, while this week it ran as 2 separate hours, much higher in the 2d hour at 0.74 then the 1st at 0.44, while lead-out THE WILLIS FAMILY was down 0.09 to 0.43. On Comedy Central, TOSH.0 was up 0.07 to 0.70, and INSIDE AMY SCHUMER gained 0.02 to 0.48. IF LOVING YOU IS WRONG (OWN) rose 0.05 to 0.61. On Bravo, REAL HOUSEWIVES OF NY grew by 0.06 to 0.57, and NEWLYWEDS gained 0.05 to 0.25. An episode of GIRL MEETS WORLD (Disney) was at 0.55. Adult Swim’s FISHCENTER, airing at 4AM, scored a 0.44. BOTCHED (E!) shrank by 0.08 to 0.42, and GOOD WORK lost 0.05 to 0.27. A Lifetime DANCE MOMS special was at 0.39. MARRIED AT FIRST SIGHT (A&E) dropped 0.02 to 0.38. YOUR FAMILY OR MINE (TBS) fell 0.09 to 0.38. FINDING CARTER (MTV) was up 0.06 to 0.38 in 18-49s, but dropped 0.06 in its target F12-34 audience to 0.84. YOUNGER continued its multi-network run, up 0.05 to 0.21 on TV Land, and up 0.03 to 0.24 on Nick At Nite.